The fighting season continues, with Goll realizing he might have killed one opponent too many. Confronting the wrath of a dead gladiator’s stable, he discovers a much more vengeful force behind a slew of blood matches. While the gladiators fight within the Pit, Brozz fights for his life in a much different arena. Escaping an attempt on his life, Borchus finds refuge with an old friend. Struggling to both recover from his wounds and find a purpose in a little village, Halm of Zhiberia discovers that giving up a pit fighter’s life isn’t quite as it easy seems. Nor is it solely one man’s decision. And all the while, in the west, a monstrous enemy makes itself known and positions itself to strike at both the games and Sunja’s heart. 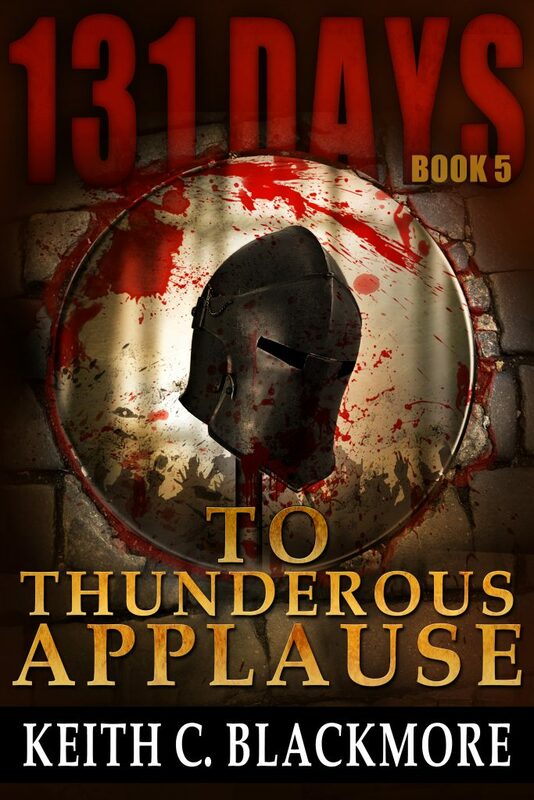 131 Days: To Thunderous Applause (Book 5). Contains violence and some language. ON SALE AT BARNES AND NOBLE! I just started re-reading this series and hopped online to see if there was another book. I’m pleased to see that there is! One question though… What happened to 131 Days: Ten?? I thought that was book two, but now Amazon lists House of Pain as book 2, and Soikes and Edges as book 3. Yet, my kindle library lists 1-4 as: 131 Days, Ten, House of Pain, Spikes and Edges… Now I’m wondering if I’ve even read About the Blood, which Amazon says is now Book 4. Hi Keith. Is book 5 – TTA available as audiobook anywhere? Listened to first 4 & would love to hear the rest if they are available. Thank you sir!